The plan had been to spend a miserable wet and cold night up on the Dark Peak – but beautiful warm dry sunny weather made for a surprisingly enjoyable backpacking weekend! 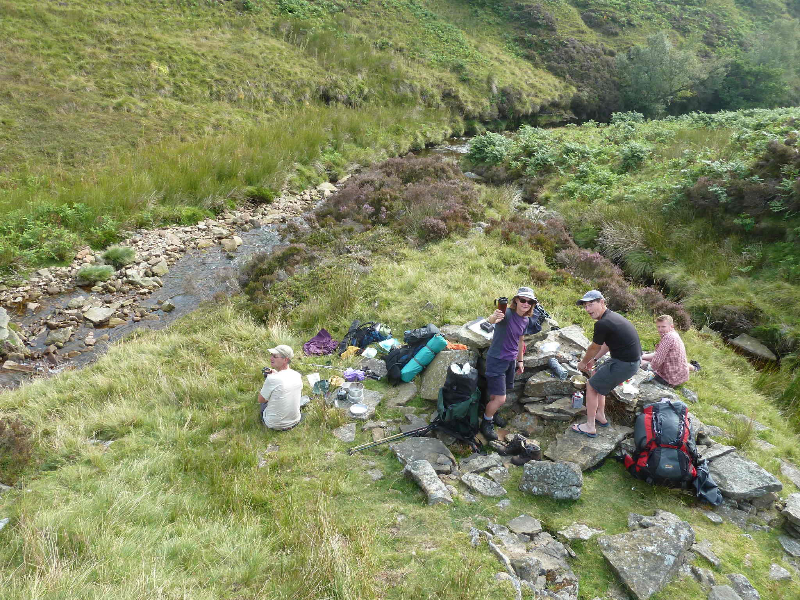 We all met up at the lovely Upper Booth campsite at the top of the Edale Valley. Claire, Alan and Maggie had arrived in the morning and grabbed a prime spot before doing a circular walk from Castleton up Cave Dale and along Mam Tor and Lose Hill (and meeting the local sheep). 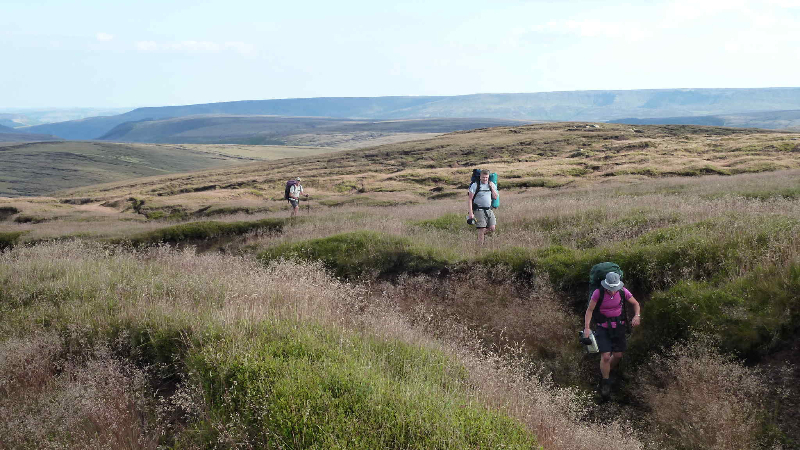 The plan for the backpackers was to attempt the Derwent Watershed Walk as featured in the book The Big Walks – a 40 mile circuit. 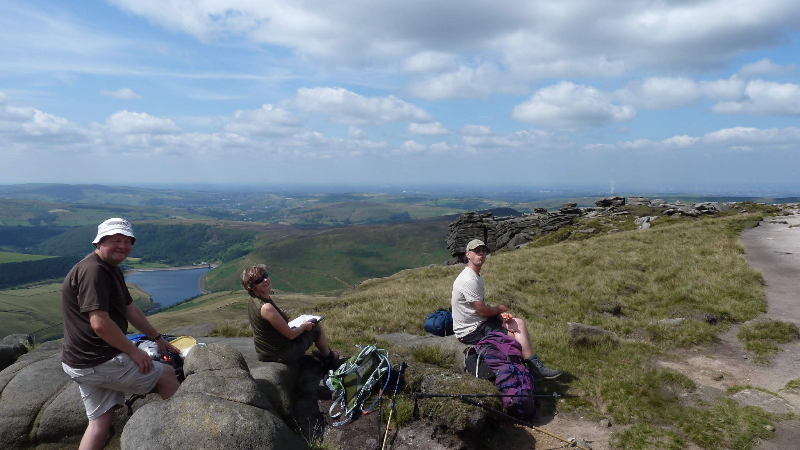 On Saturday, Dan, Keyna, and James set off for Mam Tor to commence the circuit, but as Claire and Alan had done that peak on Friday, they set off with Maggie and Pokey directly up on to Kinder Scout via Jacob’s Ladder (and a 4 mile shortcut). 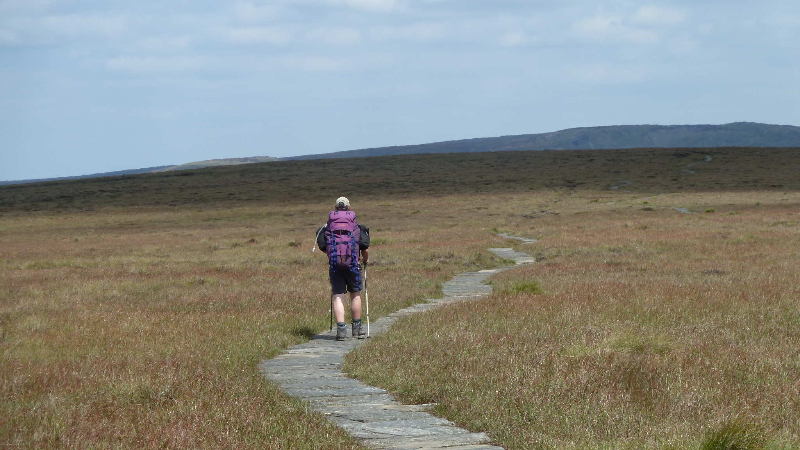 Maggie and Pokey were walking a complete circuit of the Kinder Plateau, so at the far edge, Alan and Claire bid farewell, and continued onwards across the monotonous paving stones to cross Snake Pass and on to Bleaklow Head. The trangia then came out for afternoon tea in the sun, admiring the views, waiting for the others to catch up. It was then peat bog hopping time off the main path – but the bogs were bone dry, and it was all very pleasant in the late afternoon sun. 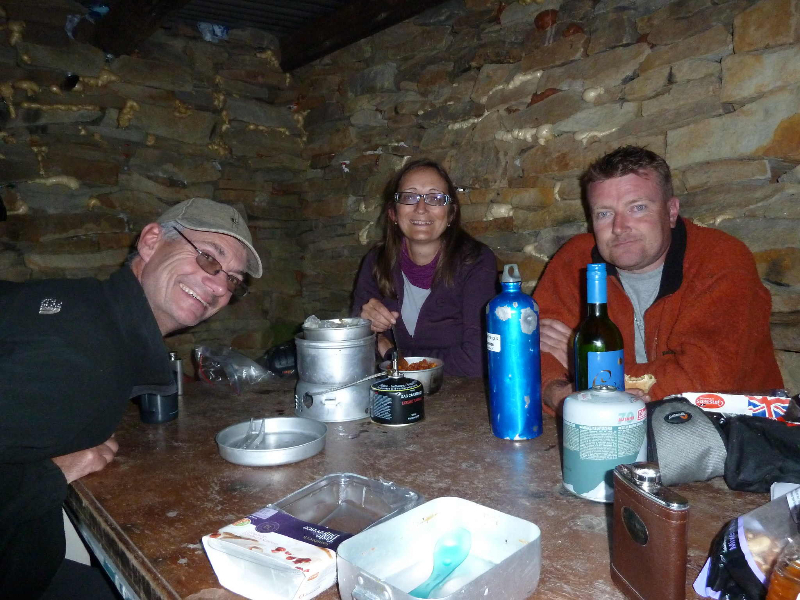 The aim was to find a “lonely” shooting bothy below the river Derwent where Dan had slept many years before (and is featured in the book) but despite its remote and difficult to find location, 5 others had the same idea, which did make for an entertaining evening, particularly as the others had brought candles and a radio (the 3 students downed their bottle of whisky themselves though)! 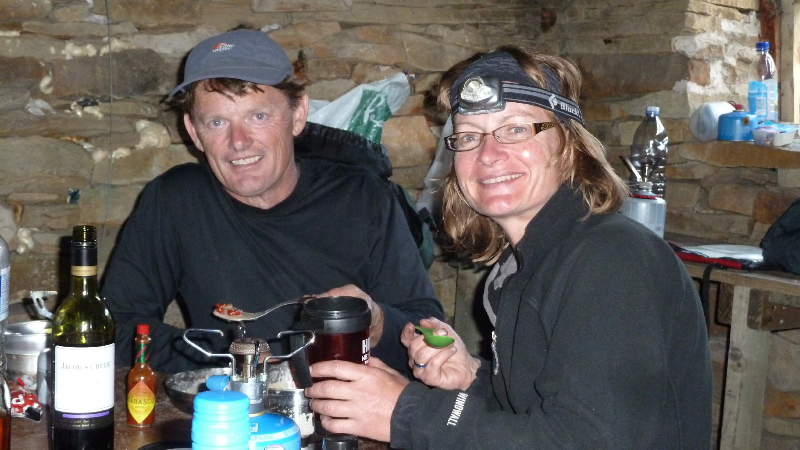 We pitched our tents just below the bothy by a midge laden stream, and retreated very quickly to the sanctuary of the bothy. But by first light, the midges were lined up waiting for us, which made for a very hasty getaway – Dan (who had slept in his bivvy bag) did not get off lightly and was covered in red splodges. We later found a very pleasant midge free zone by the river to cook up our bacon butties for breakfast. 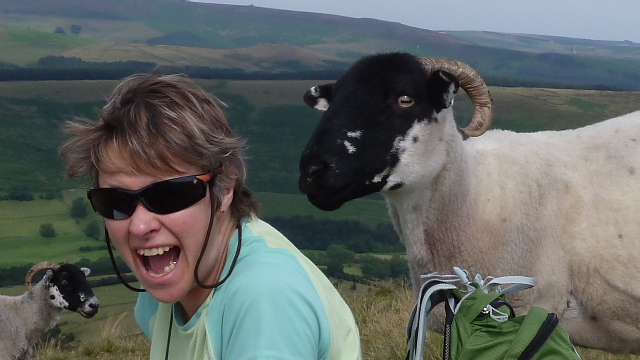 At Margery Hill we opted for the “short” circuit back to Edale, and headed down to Derwent Reservoir for a tea stop. 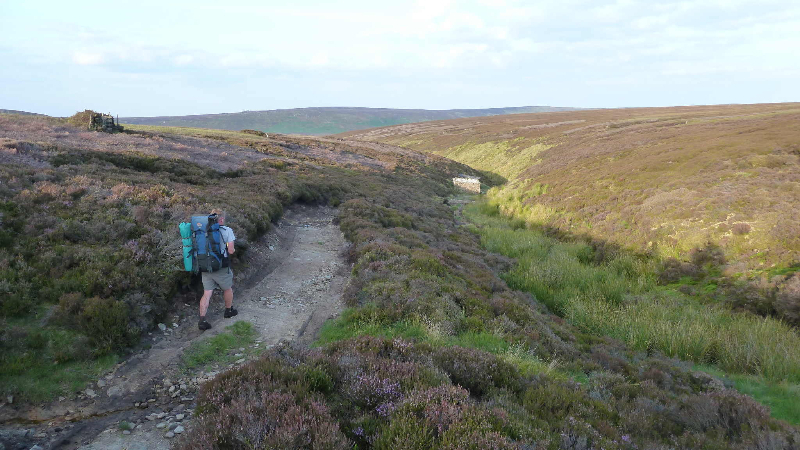 We then had to get across 2 hills before getting back into the Edale valley, and what seemed a long traverse back to Edale where we came to an abrupt stop at the pub for a well earned beer and food, rather than first going back to the campsite for the cars. 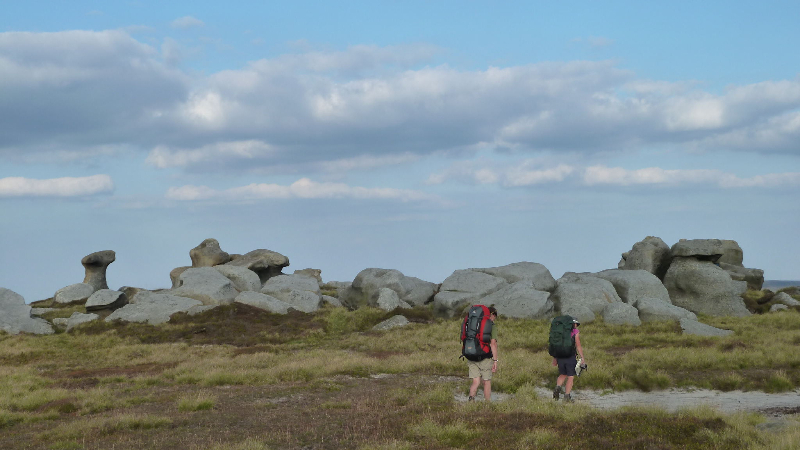 A brilliant adventure, which we should do more of (Dan’s plan is to work through the walks in the book) – though the great weather did contribute significantly to the enjoyment factor!